Kids yoga and teen yoga and mindfulness classes for emotional and physical wellbeing. Sunshine and Light provide fun kids yoga and teen yoga and mindfulness classes that focus on increasing fitness and flexibility as well as providing relaxation to help cope and manage stress, anxiety and mood. 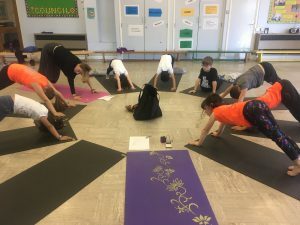 The yoga classes are especially catered for children aged 4-18 and are run by Claudine who is fully insured and hols an enhanced DBS certificate. Claudine also holds a fully up to date first aid certificate. The yoga classes focus on the body as a whole, involving yoga postures, breath and movement, creating a sense of overall calm and wellbeing to help improve mental and physical health. They help to increase fitness levels and benefit any mood issues by tackling anxiety, stress and hyperactivity, (eg caused by ADHD, ASD, low mood etc). To get a feel for what goes on in our kids yoga classes, click on the image below to view our gallery! We also provide yoga sessions for schools, scouting and guiding groups.